The growing concern for healthy living and a clean, safe and contamination-free environment is a big topic in today’s media and its importance will only continue to get more and more attention as time goes on. The world is thinking and going “green” and now you can profit from this growing trend. The USA made and patented Hygienitech System uses incredible suction, high frequency pulsating ultrasonic waves combined with a powerful UV-C Germicidal light to destroy and eradicate dust mites, bacteria, common viruses, mold and mildew, fungal spores and other harmful allergens and unhealthy contaminants that accumulate in mattresses, upholstered items, pillows, curtains, carpeting, draperies, children’s toys, as well as on all of the hard surfaces that humans come in contact with at home or in the typical hotel or any other type of multi-bed facility. It doesn’t matter your background. This is a business you can master in a few short days thanks to the simplicity of the Hygienitech System. You can operate your Hygienitech business as a stand-alone business as many of our 943 authorized service providers do in more than 89 countries, or if you’re already in some type of service business, adding Hygienitech services will really boost your bottom line. This is a high demand business with little to no competition, offering unlimited earning and growth potential. Rarely will you find a business that offers a proven and extremely effective service that’s almost impossible for someone to say no to. This is the only system designed to perform complete anti-allergen services throughout an entire home or multi-bed facility. There’s never been an opportunity quite like it. ARE YOU READY TO TAKE CHARGE OF A BUSINESS THAT CAN CHANGE YOUR LIFE? Easy to sell, even if you’ve never sold a thing in your life, one 2-3 minute demonstration and it sells itself. Provide complete anti allergen services to private homes, hotels, resorts, spas, vacation properties, assisted living centers, nursing homes, college and university housing, day care centers, government and municipal facilities, military bases, private yachts, cruise ships and the list goes on and on. Dust Mites excrete Guanine and medical research points to the fact that when we humans come in contact with it, we develop all kinds of allergy related symptoms and other health problems. Here’s a short list. Asthma, Eczema, Hay Fever, Bronchitis, Inflammation of the Mucous Membranes, Itchy Red Eyes, Headaches, Fatigue, Depression and more. The average mattress, no matter how clean the owner thinks it is, contains millions of dust mites producing tremendous amounts of harmful Guanine. In addition, a typical home or multi-bed facility can contain a variety of harmful contaminates– not only mattresses, but also in chairs, sofas, carpets, draperies, even children’s stuffed toys. All can easily be treated with the compact and completely portable Hygienitech system. And, it’s all accomplished with an environmentally friendly, dry and chemical-free process. THIS IS WHY THIS SERVICE PRACTICALLY SELLS ITSELF! So how do you show people just how contaminated their home or multi-bed facility is? 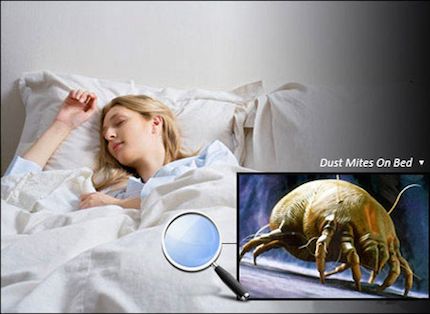 You begin by offering a Free, 3-minute Dust Mite and Allergen Detection Test on their mattress. Once they see how unhealthy and contaminated their mattress is, the rest is easy. Soon, you’ll be doing all the mattresses and just about everything else in their house or multi-bed facility on a regular basis, generally performing the service once every 4-6 months. Our equipment package is state of the art and our service and support is unparalleled. Each system comes with enough supplies to complete 1000 services. 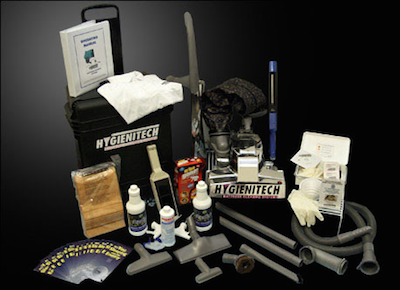 Hygienitech provides all the tools you will need to build your business, complete with a comprehensive Operating and Marketing Manual, as well as an easy to follow Training DVD.